The finish and style are exactly what I was looking for. 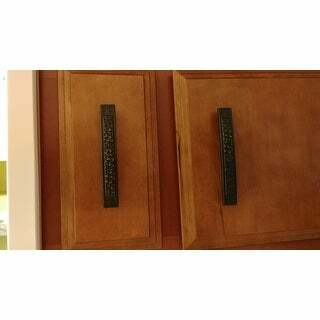 Create a unified look for your cabinets with this set of 10 matching cabinet pulls from GlideRite. Their neutral aged-bronze coloring easily meshes with a variety of color schemes. 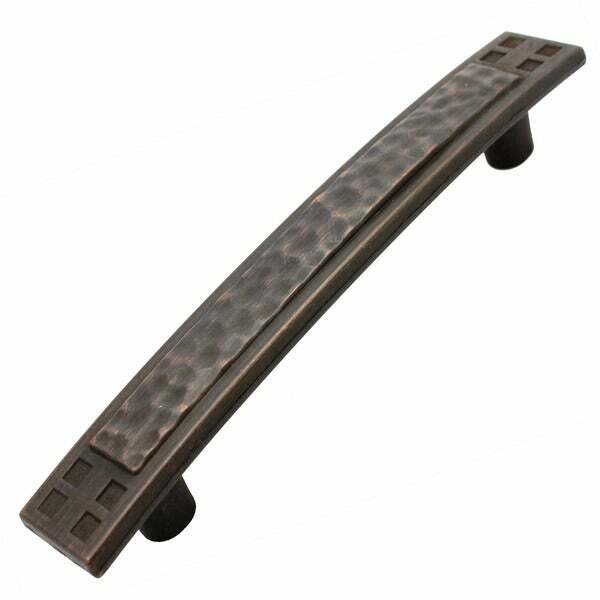 Featuring a Mission-style design with a hammered look and square details, these vintage-inspired cabinet pulls have a modern flare to allow them to complement both traditional and contemporary decor. They're pretty and match my cabinets nicely. It's just what I was looking for and I get lots of compliments. I had to go to a hardware store to get some longer screws because some of my drawer fronts were thicker. No big deal and I think most pulls will only come with one size screw so nothing against this product in particular. I used these on white shaker style doors, and flat drawers. Some of the doors had gridded glass. The effect was classic vintage without being over kill. I used them on the doors as they are easier to grab than little square knobs. love these! Nice hammered look in a log home kitchen. This is exactly what I had been looking for year. Wanted a craftsman look, without being overbearing. Love the hammered look. Looks great in our kitchen. The price was good. We didn't give it a 5 because the base was not machined square and the 1 inch screws had to be replaced with 1-1/4" inch for the knobs and 1-13/4 for the handles. Most of them were almost all black, which I preferred. 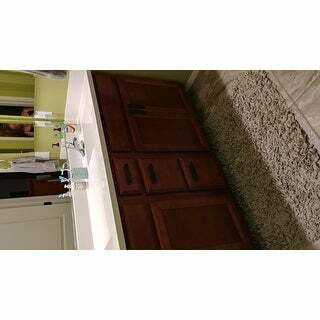 I will be ordering more for the bathroom and laundry room as they are really gorgeous. These handles are beautiful and are a good contrast to my white kitchen cabinets. These were such a compliment to my cabinets when I upgraded them. They are really pretty the picture doesn’t do them justice. I luv them! Only draw back is you have to buy them by the bag of 10. 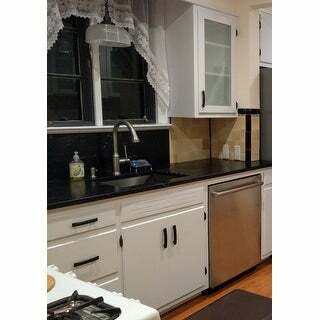 The cabinet pulls looked good, but installation was a problem. The supplied screws did NOT thread into the pulls. I had to purchase new screws, at the hardware store, to attach the pulls. Also, I had to retap a few of the pulls to accept screws. We have purchased handles and pulls many times online, this was the first time we had problems. They do look good installed, but were a pain to install. Just the style I was looking for. Kind of Arts & Craft. Good quality. Hope the oil rubbed bronze isn't too dark. Bought the 25 pack to start, and bought more to coordinate the bathrooms to the kitchen too. This is a great Arts & Crafts/Mission cabinet pull. Well made and appears sturdy ( will let you know in 25 years or so ) . Exactly as described. Love them in my new kitchen. Only wish they had a matching, longer one for bigger cabinets. Made very well , beautiful and heavy!!! These handles are substantial and look great. I was afraid they would be too long, but look great on new bathroom cabinets. Use in conjunction with smaller pulls in same style. Great piece. Didn't fit my motif so I returned. Very dark piece with some contrast. Overall good quality fixture. Just make sure the color works for you. These are absolutely perfect. I was a little wary ordering them without seeing them in person but these add the perfect touch to our cabinets! They are good quality and well made! I highly recommend these. Quality product.. it’s exactly what we were looking for. "Hi, I`m looking to purchase a pack of these and the matching knobs however I need 12 of these in total for a new kitchen we are having fitted. With shipping cost to the united kingdom added on top I`m hoping maybe you could sell me two individual one to make up the 12 rather than have to buy an extra 8 I don't need. Hope you can help Andrea"
Hello Andrea Thomas, I'm sorry we do not have this for individual sale. They are only sold in packages. Have a great day!